Hardywood owners Eric McKay and Patrick Murtaugh are collaborating on a "Phantom of the Opera" brew with the Happy Hour Guys to be released in early 2018. 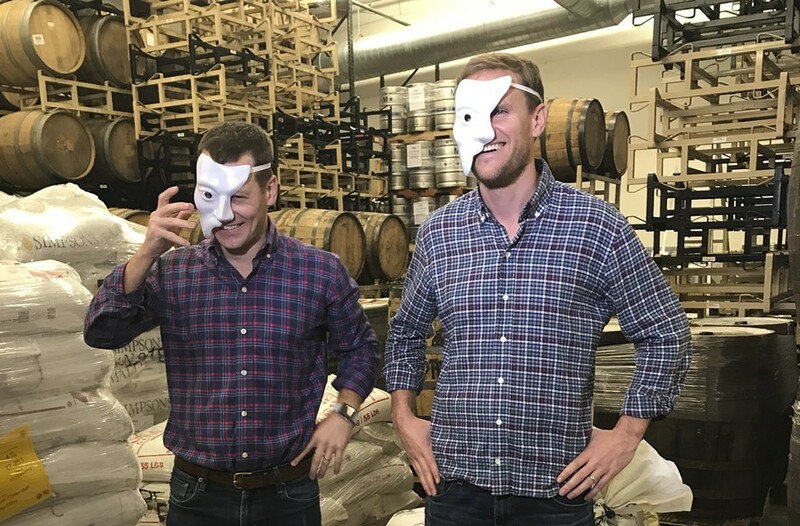 The latest collaboration beer from Hardywood Park Craft Brewery springs from a partnership with the Happy Hour Guys and Broadway’s "Phantom of the Opera." It's part of the Broadway Brews Project, which pairs a craft brewery with a Broadway show to create a themed beer, in support of a charity of the cast’s choosing. Mark Aldrich and Jimmy Ludwig travel to bars and breweries and share their stories with viewers and their 13,000 Twitter followers and 4,000 Facebook followers at thehappyhourguys.com, on Vimeo and on YouTube. They met as Broadway actors and together created the Happy Hour Guys. “The project came out of a love of historic bars and the pub culture,” says Aldrich. Knowing both theater and craft-brewing people, they noticed that the two have a lot in common: Both take risks to achieve their dreams, are passionate about their fields and go out of their way to support the community. Thus was born the Broadway Brews Project. The Hardywood collaboration is the fourth in the series. Previous partnerships paired Gun Hill Brewing from New York with "Hamilton," Carton Brewing from New Jersey with "School of Rock," and Sixpoint Brewery from New York with "Waitress" and have generated buzz in he Wall Street Journal, Rolling Stone, All About Beer, Playbill and other media. Hardywood’s marketing manager, Matt Shofner, heard about the Broadway Brews Project and reached out to Aldrich and Ludwig. In late November, Shofner and Hardywood head brewer Brian Nelson went to New York to see the show and meet with the cast to decide on style, name, label art concepts and the benefitting charity. On Dec. 3, cast members Ali Ewoldt (Christine), Paul A. Schaefer (Phantom cover) and Rodney Ingram (Raoul) and the Happy Hour pair came to Richmond for brew day. Hardywood brewer, Kevin Storm, has created a black lager inspired by the character of the Phantom. After soliciting suggestions for beer names, the Guys, Phantom cast members and Hardywood narrowed the entries down to a list of finalists, including Lot 666, Pint of No Return, Drink of Me, Darkness Stirs, Wishing You Were Somehow Beer Again, Phantom’s Lair Lager and Chande-beer. The winner has been chosen, but it won't be announced until after necessary government approvals. During this process, all upfront expenses have been shared between the teams. The brewery covers brewing costs and the Happy Hour Guys cover the production of the episodes. “We are so excited to head back up to NYC in early 2018 to release the beer, celebrate everyone’s commitment to this one-of-a-kind opportunity and begin raising funds for a wonderful organization,” Shofner says. It will be available in New York at select bars and restaurants in the Theater District and at the Majestic Theatre, as well as in Hardywood’s Richmond and Charlottesville tap rooms. For updates on the beer name, release date and charity, follow @TheHappyHourGuys or @Hardywood on social media. The videos will be available on Vimeo and YouTube. The Happy Hour Guys anticipate two more partnerships, creating a literal six-pack of collaborative beers.